I can't for the life of me guess why they named the airline t'way. According to Wikipedia, there are only 6 planes in their fleet. Excellent depiction of a kangaroo on a vector, hopping his way to the bathroom to throw up. 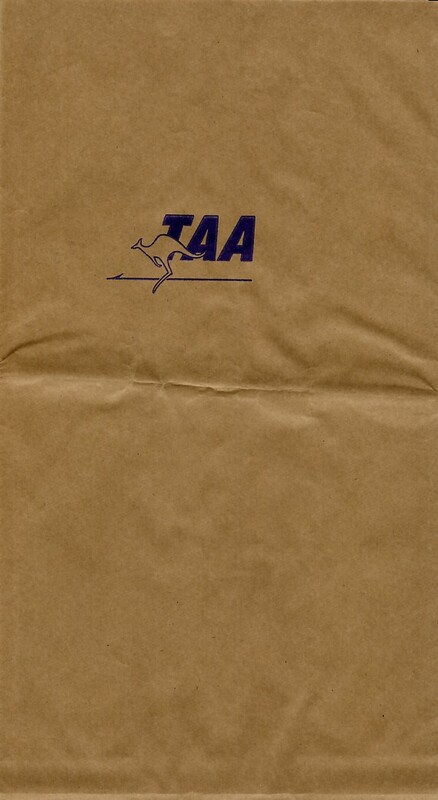 Vomit Enthusiast Neill Murray says, "The TAA bag (Trans Australian Airlines) is actually from TAA (Trans Australia Airlines) – no ‘n’ in ‘Australia’. 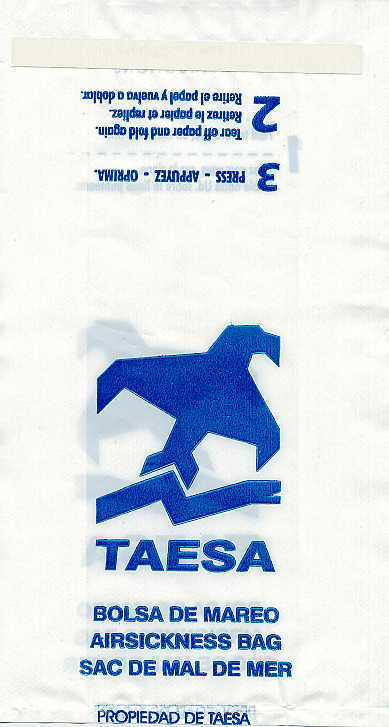 When TAA changed its name in 1985 to Australian Airlines the ‘n’ was added." Thanks Neill! Excellent depiction of a kangaroo on a vector, hopping his way to the bathroom to throw up. 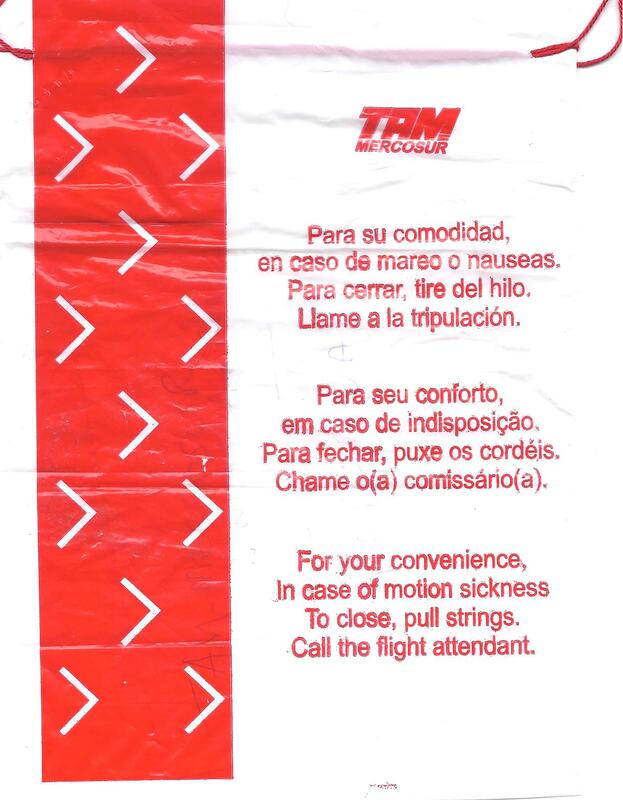 Vomit Enthusiast Neill Murray says, "The TAA bag (Trans Australian Airlines) is actually from TAA (Trans Australia Airlines) – no ‘n’ in ‘Australia’. 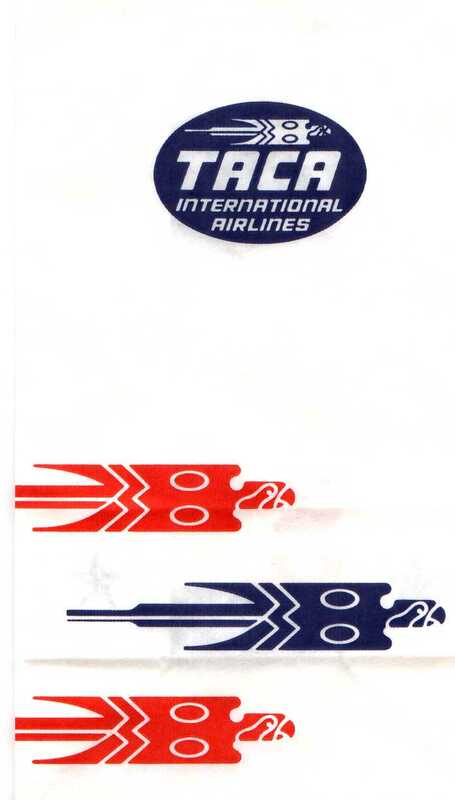 When TAA changed its name in 1985 to Australian Airlines the ‘n’ was added." Thanks Neill! Probably one of the coolest bags in all of Angola. The horns of the frowning ram curl all the way around its head, much like the fingernails of people who don't clip them for ten years at a time. 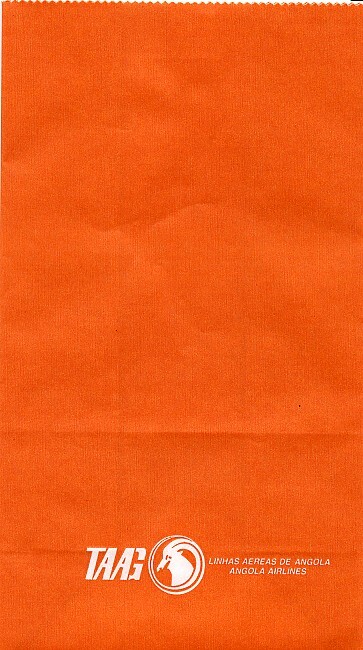 Identical to earlier TAAG bag, except the visually non-contrasting white on orange scheme has been replaced by Halloween colors, black on orange. I finally have one of these -- it's a long story! Take-A-Chance-Airlines. 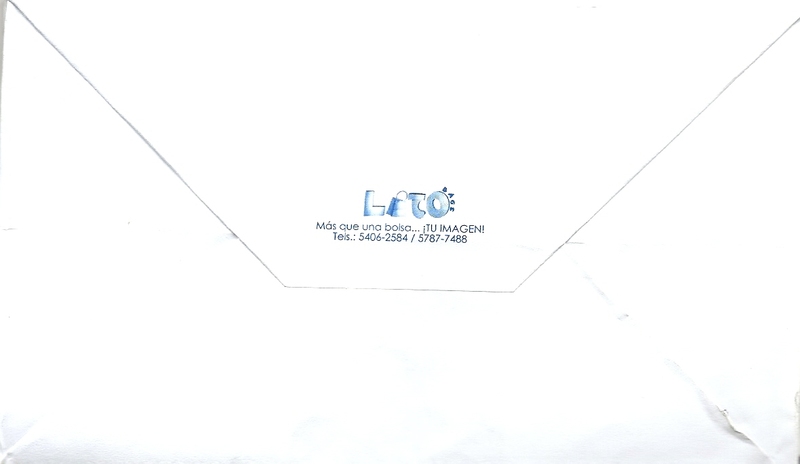 Very basic blue bag with Sabena-like oval around logo. 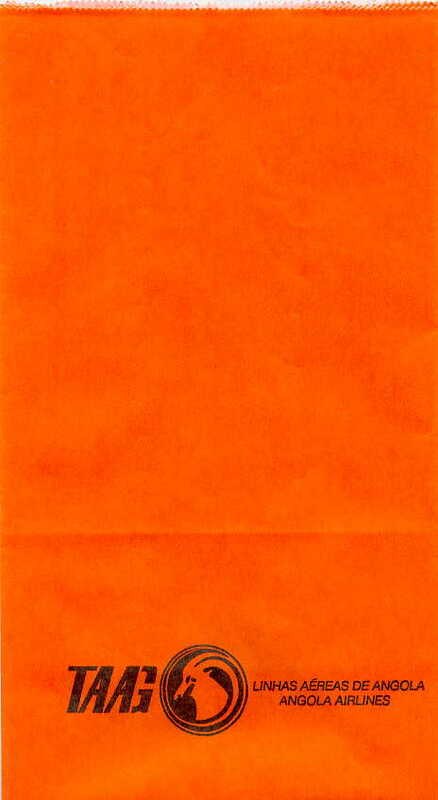 Anyway, first I purchased one of these in an eBay auction from Jack Rupard. Life was good. 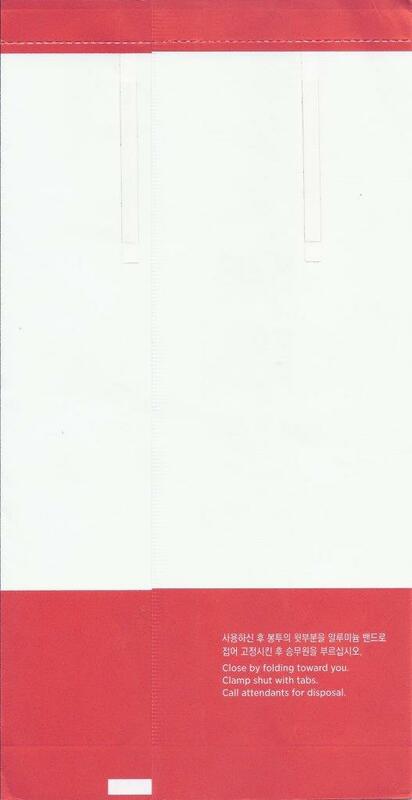 Then I received a 2nd one as part of Christoph Vogel's collection. When I listed this bag as a swappable item, two collectors battled for it. 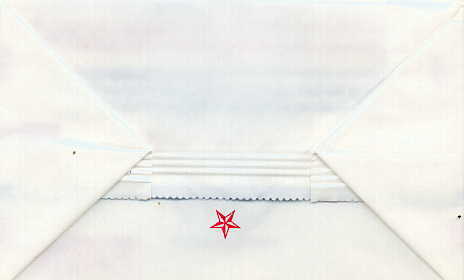 I agreed to send it to one collector, but the other collector claimed I had promised it to him (I had not, we were negotiating a several bag trade, but he assumed this one was a given). 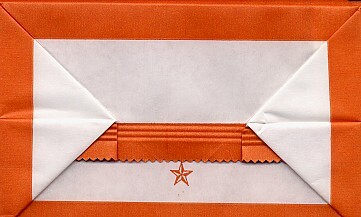 In order to preserve honor, I sent him the bag. So I had none. And then Jack Rupard came calling again asking for a stack of safety cards in exchange for all the bags he sent. So I was out the bag, plus many safety cards. Finally, I got the gift that keeps on taking from Matthias Koch, purchasing it over eBay for almost 30 Euros. 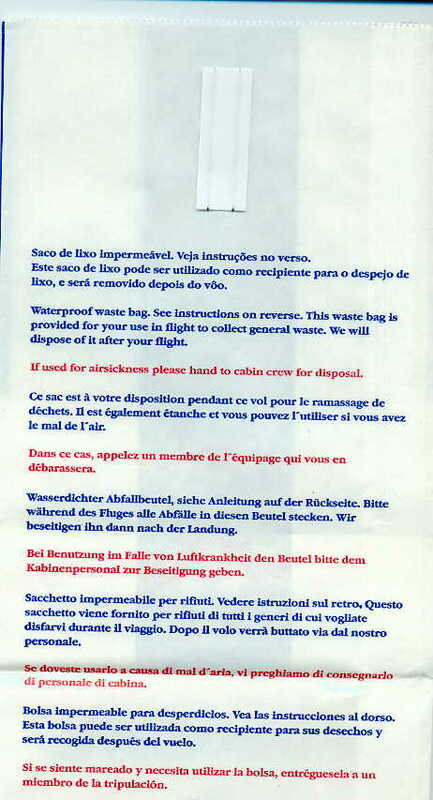 Central American Airline. Blue Logo and funky Red and Blue Parrots. 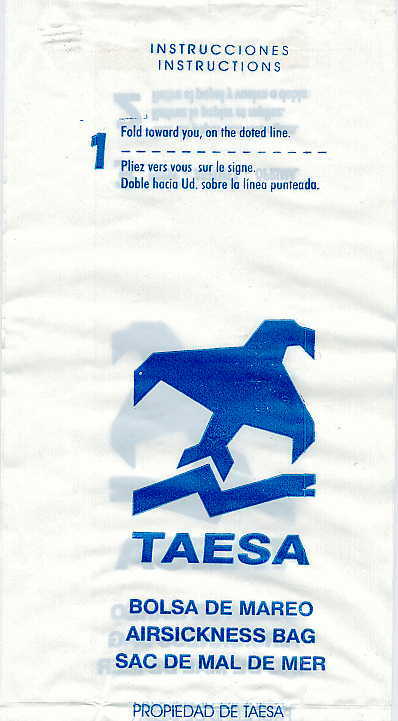 Exactly like the other Taesa bag except this on has a slightly different font and doesn't sport the ubiquitous Propiedad De Taesa (Property of Taesa) admonition, which it felt was necessary in the subsequent model in case some other airline decided to steal their motherlode of bags. 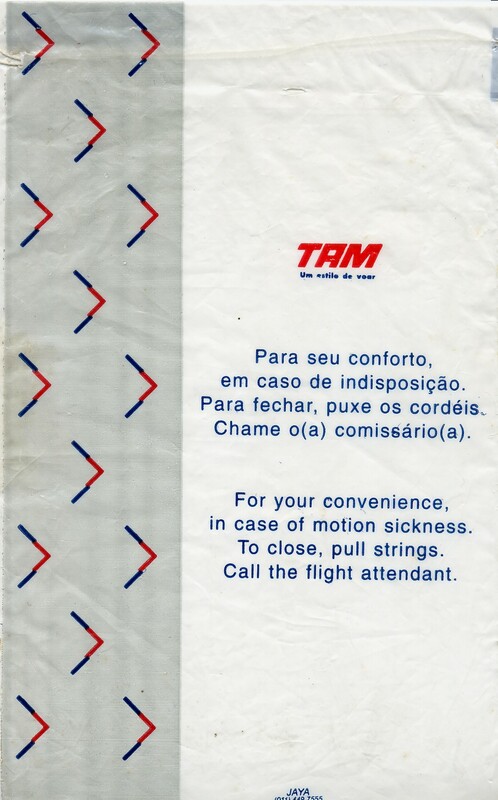 If you hold this bag up to the mirror (or just look right through the flimsy bag from the back) this Brazilian Airline's name looks eerily like JAT, a Yugoslavian airline. 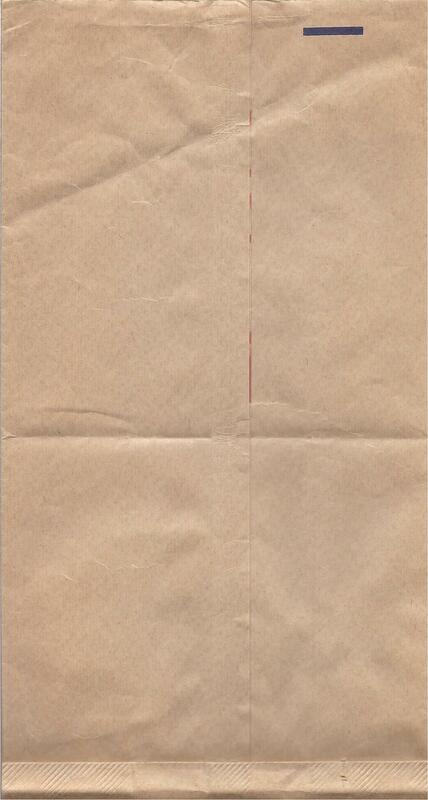 Apparently either this bag is only for 'Executivos'. 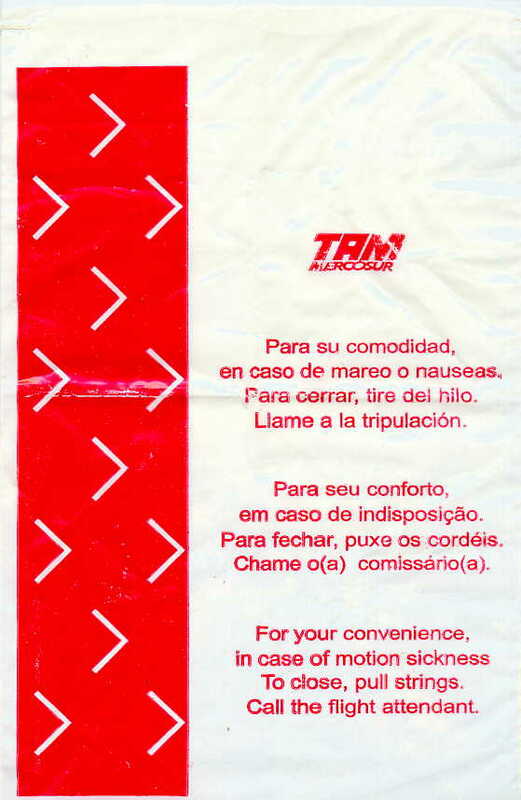 This Guatemalan bag also says "Nuestro mejor destino es satisfacerle", which I think means that their finest destination is merely satisfactory. 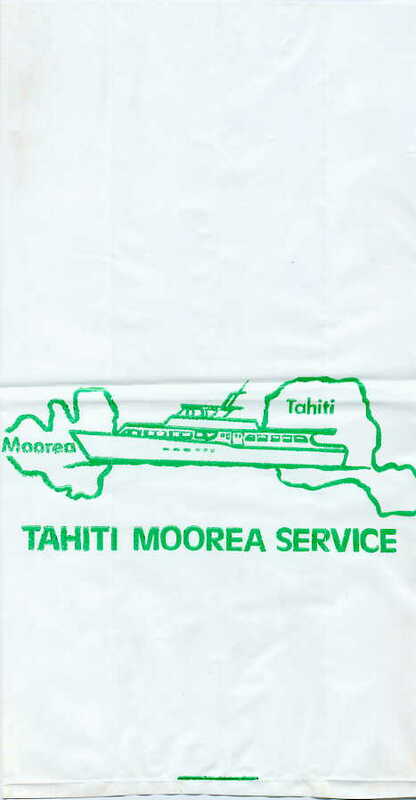 If for some reason you happen to need to get from Tahiti to Moorea, and during your ferry trip you get seasick, this is your bag! If the ship is as big as represented on the bag, you could just walk between the two islands. White plastic w/five multi-color airplanes. Happy children pilot four of the planes. However a very sick king is piloting the fifth. Very nice bag. According to royalty expert Chris Ed Rock ,"The sick king piloting a merry-go-round plane is Otto Soglow's The Little King. The Little King was a famous character in US cartoons for decades, appearing in his own newspaper strip, in numerous gag panels (including in The New Yorker) and as magazine ad spokesperson for Royal Pudding. A food product, see? Another footnote is that although The Little King was a spokesperson, he never spoke in any appearance, anywhere, although other characters with whom he would interact would speak as required. I am continually amazed by the breadth and knowledge my uber-cultured visitors possess. This plastic bag has a fat tire track on its left side. In fact, if you look at one of the original Frogger Arcade machines, you see the same tire track going down the left side of it. 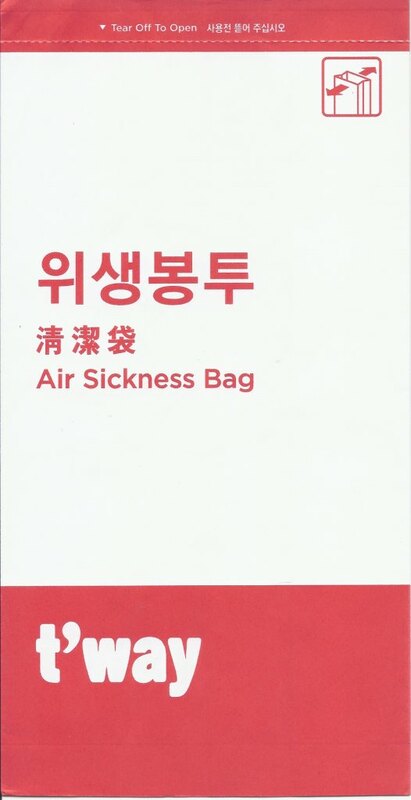 Could this bag's designer have worked for Sega? 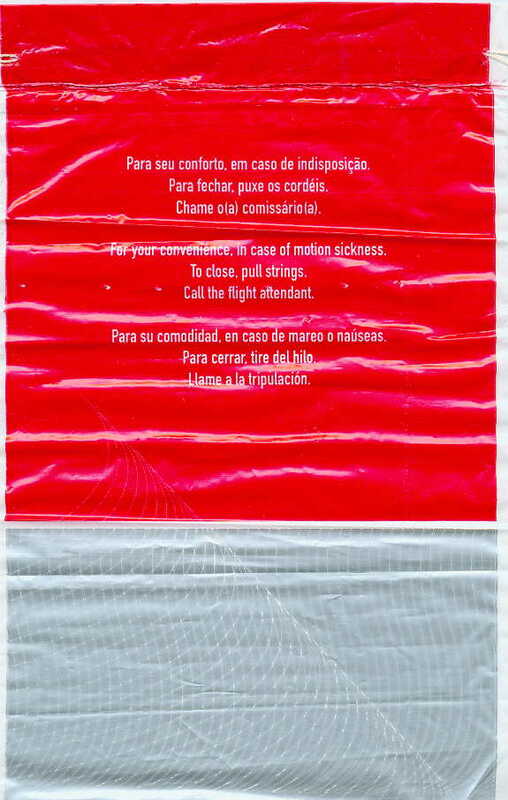 This bag is different from the 2001 bag because it doesn't yet have Spanish on it. A fine Jaya product. 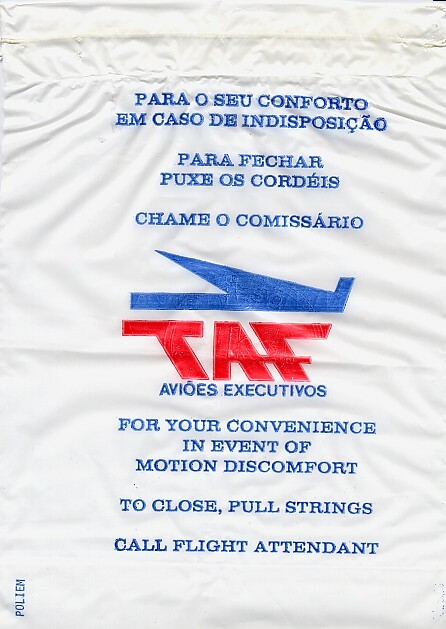 Another excellent TAM bag, this one sporting pictograms lined up as if part of a bowling alley, where the 2 and 3 pins have been knocked down. This plastic bag is rather shiny and generic. 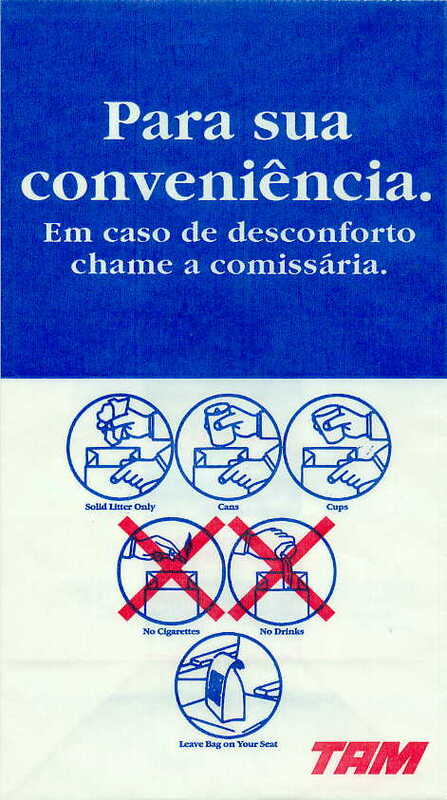 Has Portuguese, English, and Spanish, plus a very slight windfoil direction field that covers the silver portion. 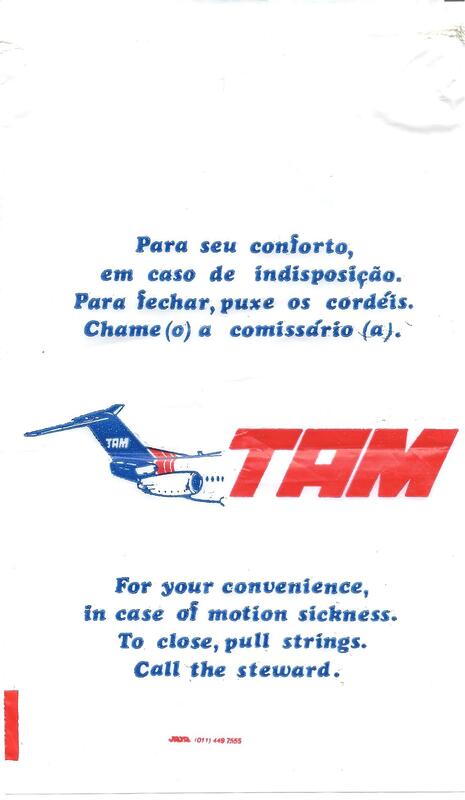 Can't really tell it's from TAM at all. 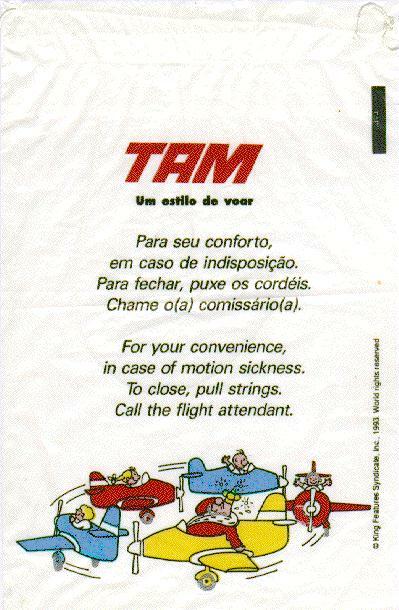 Yet another excellent TAM bag, this has the Frogger-like tire track on the left, but it also mentions Mercosur, which is a Regional Trade Agreement between Brazil, Argentina, Uruguay, Venezuela, and Paraguay. 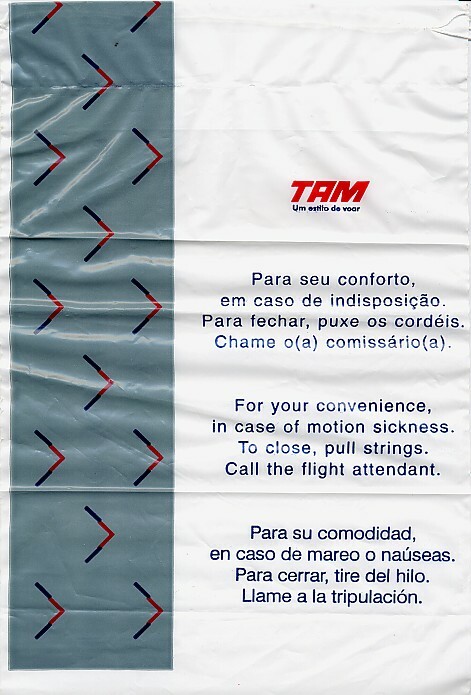 This bag is identical to the other TAM Mercosur bag except that the draw string is now red instead of white. 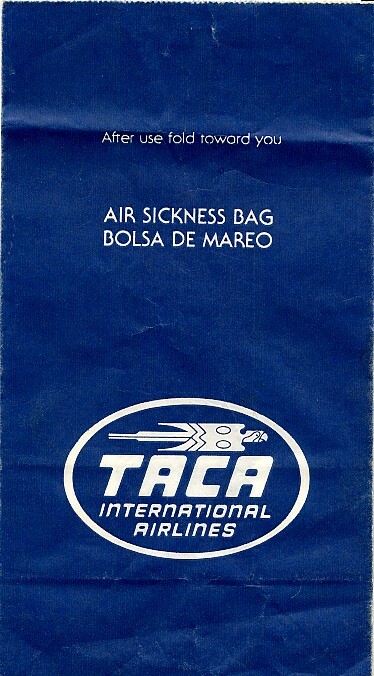 Excellent bag with the back half of a plane pictured on the front.